As we age, the visible changes are manifested on a number of levels: skin may become loose and inelastic, jowls become deeper and more pronounced, the neck slackens, and the youthful volume from the upper cheek region and mid-face decreases. Restoring youthful beauty with a facelift takes all of these elements into consideration. The best approach is always one that reestablishes facial harmony and a refreshed appearance. Deep Plane Facelift is one of the myriad techniques available to rejuvenate the face. For patients and physicians who are familiar with the variety of techniques used worldwide, they understand that the Deep Plane Lift technique cannot be surpassed. Since this technique involves release and re positioning as opposed to the suture pull typically used in the majority of other lifts, there are no opposing tension forces. Without a doubt, this provides a much longer lasting result without the scarring or irregularities potentially seen with other lifts. Using an advance Deep Plane release, the doctors are able to more comprehensively and naturally rejuvenate the face. This lift rejuvenates the face and neck completely while maintaining an attractive, slender and elegant appearance. The Deep-Plane Facelift is the most sophisticated procedure available today and studies have shown that it is the most effective procedure available for re positioning sagging soft tissue. This is why it has won the devotion of patients and acclaim from the plastic surgery community. As a modification and advancement of the standard facelift, the deep-plane facelift involves repositioning all the drooping facial soft tissues that are involved in facial aging. Since only the deeper SMAS layer is utilized to reposition all the drooping facial tissue, no tension or tightness is ever needed or placed on the skin. If the skin is never pulled in doing the facelift the result will never produce a pulled, tight or plastic appearance. This facelift is the most effective in restoring the midface and nasolabial folds (creases from our nose to our mouth) because the fat pads in the cheeks are lifted and repositioned removing facial hollows and restoring our cheekbone shape. In addition, since the SMAS layer is connected to the loose muscles of our neck, a deep-plane facelift is also the most effective in recreating our smooth neckline. Areas such as loose buccal cheek fat (the part of the face that produces jowls) can be assessed and treated during the procedure addressing aging changes that were not accessible before. Since the deeper layer that is utilized is fibrous and inelastic, unlike the skin which is very elastic, the procedure produces the most long-lasting results of any facelift technique. The deep-plane technique can be modified to include only the midface, from under the eyes to the jawbone, accomplishing a significant result in a limited region. Dr. Milan Doshi is a board certified cosmetic surgeon who is highly specialized in facial surgery procedures. He takes an extraordinarily detailed approach to each procedure and customizes every facial surgery to the needs of the patient. He examines every aspect of the face and neck, carefully taking note of each individual issue so that they can be addressed during their surgery. It is Dr. Doshi’s goal to maintain the patient’s natural beauty. Therefore, during the face lift surgery, Dr. Doshi is able to precisely tighten and sculpt facial features and restore volume, preserving the patient’s natural facial contours for a natural and vibrant outcome. It usually requires less downtime than other facelifts. Most people can get back to work after a relatively short initial recovery period of two weeks. With the deep plane technique, less swelling and uncomplicated scars help for speedy return to normal activities. This is another reason why celebrities love this procedure. It may take few weeks for patients to see the final results of their facelifts. Nevertheless, as recovery progresses and swelling subsides, patients should begin to enjoy a younger, more alert appearance. Allure MedSpa which is renowned for its state-of-the-art internationally acclaimed services, offers affordable and cost effective cosmetic procedures. To know more about the cost of your procedure request a consult by filling the form below. Your consultation is your chance to ask questions about Facelift Sugery and put your mind at rest. Your surgeon will be able to offer you full explanations and answers to all of your queries. Alternatively, our counsellor will call you at your convenient time. Request a consultation right away: Book a counselling session. You should avoid strenuous activities for a week after surgery to decrease any swelling. Most patients return to work in 10 days to two weeks. To ensure a safe surgical procedure, a thorough medical history is taken your current health history as well as your medications and drug allergies will be reviewed. We are pleased to offer and arrange comfortable lodging, restaurant, and commuting to ensure a memorable pre-and post-surgical experience for our out-of-country patients. Please feel free to contact the Counsellor book a counselling session for assistance with any of your travel and planning needs. Deep Plane Facelift produces longer lasting results than other facelifts. Deep plane facelift is leaves little or no trace of a facelift having occurred. There is no pulled skin, no telltale, and plastic just-had a-facelift look. After a deep plane facelift people simply look well rested, rejuvenated and fresh, not as if they’ve gone under the surgeon’s knife. At Allure MedSpa, our support doesn’t end when you achieve your cosmetic and health goals. Lifelong follow-up with our multidisciplinary team is encouraged, helping you to achieve and maintain optimal results. For more information on Deep plane facelift surgery and our extensive aftercare program or to schedule an appointment, call Allure MedSpa at: +91 9869041559. Why do you say the deep plane facelift is more effective than other facelifts? The deep plane facelift allows a surgeon to do a more thorough job in addressing the effects of ageing on the face and neck. It lifts the whole face by repositioning deeper tissue layers. The result accentuates the cheekbones, jawline and neck. It is particularly good at lifting the mid face, an area that does not respond well to other types of facelift. The best thing about this is patient look much better, and, of course, much younger, but not glaringly so. This is very much appreciated nowadays, as people move away from obvious results toward subtle improvements that stand the test of time. In my view, all of these factors make the deep plane facelift far more effective than any other type of facelift available right now. 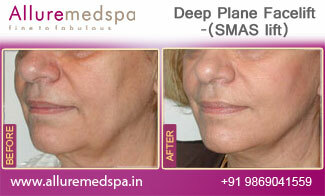 How can better results be possible with the deep plane facelift? With the deep plane facelift, the surgeon can work with the actual problem areas, ‘lift up’ the tissue and fix it more permanently than is possible with the skin only facelift or a standard SMAS facelift. Skin-pulling facelifts only offer a surface solution. They do not address the actual problem, but offer a band-aid fix to facial ageing. The SMAS facelift technique, sometimes referred to as the ‘muscle pulling facelift’, goes below the skin to fix the problems associated with the ageing face. It produces far better results than skin-only methods. But the SMAS can only achieve a certain level of success, because some problems associated with facial ageing go deeper than the SMAS layer. And with this technique, some skin pulling is often necessary for good results. The deep plane facelift, without resorting to half measures, addresses the source of these problems: the deep tissue layers of the face, below the skin and the SMAS tissue layer. During a deep plane procedure, the deeper tissues of the face are released from their underlying muscles and reattached at higher anchor points. This is how the whole face gets lifted, allowing for superior results. Is the deep plane facelift a more serious surgery compared to other facelifts? Yes, because the surgeon requires superior skill and expertise in handling the deeper tissue layers of the face to perform a successful deep plane facelift. No, because, from a patient’s point of view, it really should not be considered a ‘more serious surgery’. Recovery times after deep plane facelifts are relatively short, compared to the alternatives. This is because most of the surgical work is done on deeper tissue layers of the face, rather than near the surface. Is it riskier or have more complications? The deep plane procedure is not any more risky than other facelift techniques. In fact, it leads to fewer complications. Does it hurt more than a regular facelift? No. In fact, I can honestly say it hurts less than most other facelifts. Because there is little trauma to the skin with its high concentration of nerves, people undergoing the deep plane facelift usually have a relatively painless recovery. Who is a good candidate for the deep plane facelift? Because the deep plane procedure addresses muscle and tissue laxity at the source of trouble, facial plastic surgeons can recommend it to relatively younger people who’d like to prevent the signs of ageing from appearing in the first place. That said, the deep plane facelift can benefit people at any age. It is particularly attractive to some of the older crowd who want to look a bit younger, but do not want to look dramatically different. Some older patients—what you might call typical facelift candidates—also say that they’d rather not undergo another facelift. They deeply appreciate the long lasting results the deep plane technique can produce. I need a revision facelift. Will the deep plane facelift work for me? A deep plane facelift allows the surgeon to go to the source of the problem and fix it there. So a deep plane facelift is actually the preferred technique to be used on someone who needs a second or subsequent facelift. Why does the deep plane facelift cost more than other facelifts? As mentioned before, the deep plane technique requires the skill and experience only a few facial plastic surgeons possess. Naturally there is a premium price tag on such expertise, which is the primary reason a deep plane facelift costs more than a regular SMAS or skin pulling facelift.